This brief article concerns the impending treaty negotiations between various Indian tribes and the U. S. government, which would eventually be signed at Medicine Lodge Creek, Barber County. 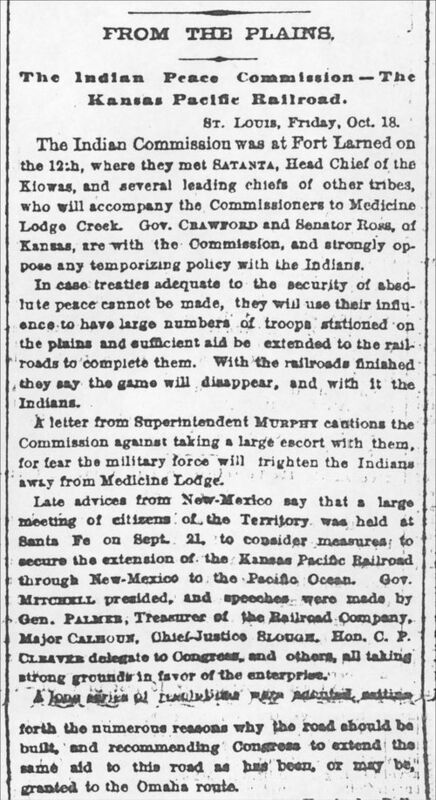 The article mentions that, in case no peace treaties are signed, the military will protect settlers by stationing more soldiers on the plains and by hastening the completion of more railroads. These railroads would ensure that game animals, essential to the livelihood of the Indian tribes, would be wiped out. This source demonstrates the increased military presence on the plains and illuminates how the U.S. government hoped to deal with what they called "the Indian problem." The article mentions the depletion of natural resources and could work in tandem with documents and images related to the depletion of the buffalo.